contrary to popular belief that global warming will lead to population explosion in insects, a recent study claims otherwise. It says the phenomenon will lead to extinction of insects in the tropical zone by the end of the century. Survival options are two: either they learn to adapt to the rising temperatures or migrate to higher latitudes, the authors said in the paper published in the May issue of Proceedings of the National Academy of Sciences. Insects in the temperate zones and the poles could in fact experience a dramatic increase in numbers, the study says. The reason for extinction, the authors say, as temperatures increase insects will not be able to perform physiological functions such as reproduction and locomotion. Since they are cold blooded, they cannot regulate their body temperature. Classed as ectotherms, they operate in a specific temperature range called critical thermal limit. As the temperature increases in this range, physiological activity increases. It reaches an optimum level and then declines sharply, said the researchers of University of Washington, usa, who carried out the study. 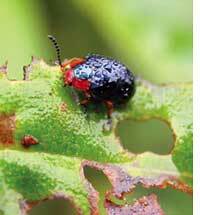 Tropical insects are already at the higher end of the critical thermal limit and hence the threat is imminent. Insects in colder regions may survive and proliferate because they are still at the lower end of the temperature range. For example, pea aphid sampled at 52N, has a critical thermal limit of -10C to 35C. But the maximum temperature it has lived in has been 20C. But in case of a pod sucking bug, a tropical insect sampled at 6N, the limit is 15-32C and the maximum temperature has already gone up to 32C. "In the tropics, many species live at or near thermal optimum, a temperature that lets them thrive. Once temperature gets above the optimum, fitness levels will decline quickly," Joshua Tewksbury, author of the paper, told Down To Earth. For the study, the researchers used temperature data from 1950 to 2000 as the baseline climate condition and added Intergovernmental Panel on Climate Change's climate model projections for rise in temperature in the 21st century. They compared the projected temperature data with physiological performance of a variety of temperate and tropical insect species and other ectotherms such as frogs, lizards and turtles. The researchers also studied previously published data on critical thermal limit of various insects, frogs, lizards and turtles from different locations. Using this data they calculated physiological performance under different temperature conditions. They found population growth in the tropics were expected to decrease by up to 20 per cent, a clear hint that global warming will substantially reduce fitness. They said if global temperatures continue to rise beyond the 21st century, species in higher latitudes will experience a similar situation. A study published in the April 2007 issue of Journal of Thermal Biology had linked temperatures with oxygen and said that extreme temperatures can lead to hypoxemia (oxygen shortage) in ectotherms. Global warming will also affect the distribution of marine ectotherms. "The conclusion is troubling because it places the greatest biological risks of climate change in the tropics where biodiversity is greatest," the Washington university authors wrote. Experts fear changes in insect numbers could have secondary effects on plant pollination and food supplies. Raghavendra Gadagkar, professor at Centre for Ecological Science, Indian Institute of Sciences, Bangalore, said: "Since tropics contain most of the world's poor people, the consequences will be serious. It is therefore even more imperative for us to do our bit to mitigate the effects of global warming."